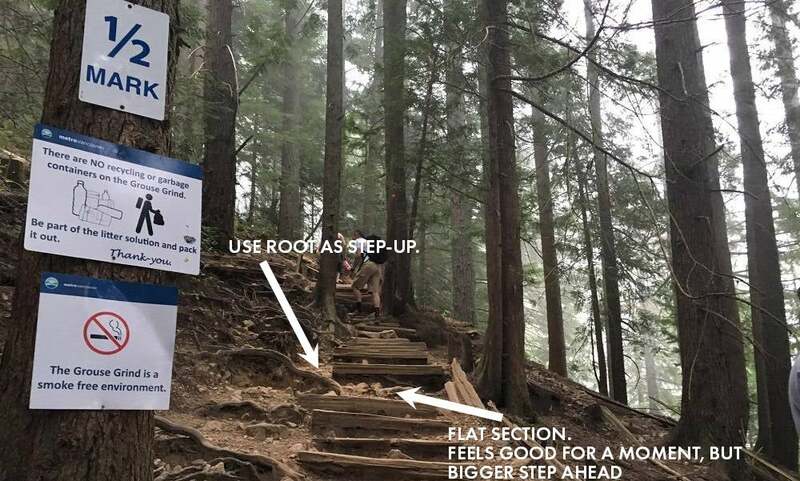 10 Grouse Grind hacks (2/10) - Brandon Crichton, Personal Real Estate Corp.
You want every stride to get you closer towards the top. Though, it may feel great to step from one root or rock to a flat section for that moment of recovery, it sets you up for a larger energy expenditure to to go back up again. I make sure every single step I take is in an up direction. Throughout the grind there is roots and rocks that make this possible. Not only does this keep me in check for "consistency (hack #1)" but it keeps my mind actively looking for the next best place to step up to. I certainly don't condone going off-trail to make this happen; and you shouldn't ever need to. The grind is typically broken up into the dusty path, and a rocky/rooty side. find the roots and rocks that keep your steps heading UP the mountain and give it a try. Don't step down, Don't step flat, Step Up! Brandon is a local North Vancouver resident and regular Grind'er. You'll rarely see him on a weekend (too busy) but early mornings or late evenings is more common. Brandon has been doing the grind for more than 10 years after moving to North Vancouver from Ontario.These hacks have been tested solely by him and all readers should truly assess their own fitness goals and abilities before following them. Speak with a doctor or running coach before heading out and tackling the Grind. The Grind is a heavily hiked trail with lots of people traffic. Use caution when on the Grind and always respect other trail users.